Thanks to a previous career that required a lot of business travel and plenty of travel opportunities as a blogger, I have become quite expert in packing for travel. 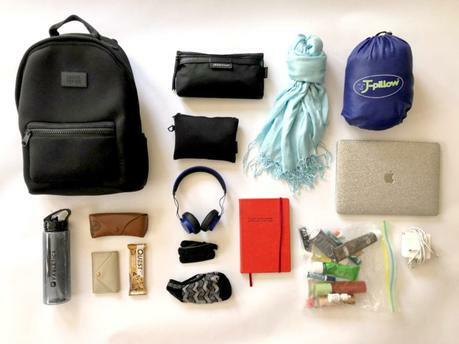 I find especially for airplane travel, your carry-on bag contents determine how comfortable of a flight you will have. 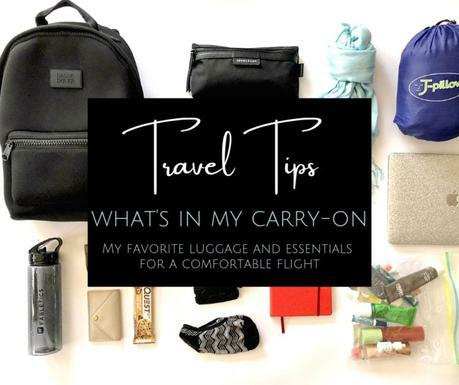 Friday I am traveling to California and wanted to share what I put in my carry-on bag to have as relaxing and comfortable a flight as possible. Read my previous Dagne Dover Dakota Backpack review. 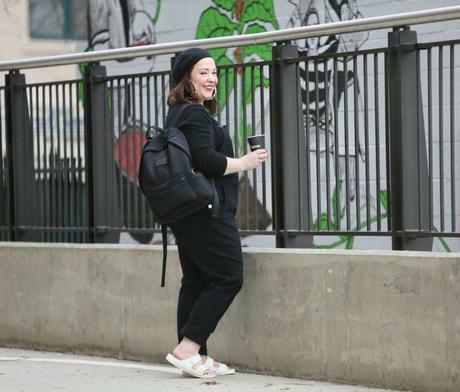 I still am rocking the same backpack (FYI I have the Large size) and it still looks like new though many flights, train trips, and everyday carting my everything. 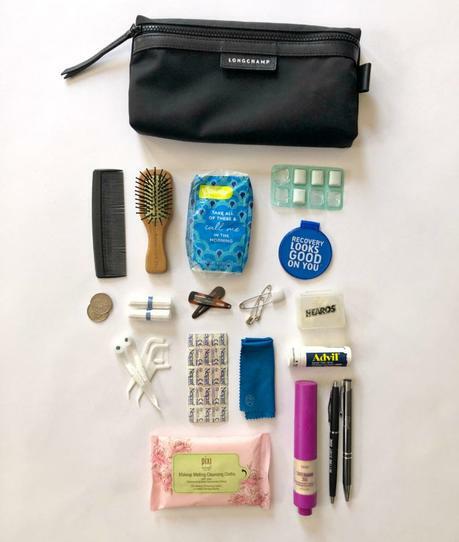 I love the organization; so many pockets, a place for my laptop, and it's so easy to access what you need even when stuffed under a plane seat. I am all about pouches; it's how I organize my daily purse and it's also how I organize my travel bag. Tissues - Because life happens. Gum - For popping ears and fresher breath. I usually carry more than one pack. Mirror - A phone's selfie camers can work, but sometimes it's just nice to have the real thing. Change - If I need to make a call, if I need to rent a trolly, if I want to give a tip at the coffee shop... I always carry a few quarters and dimes in my bag. Barrettes and Safety Pins - Because life, fallen hems, busted seams, and bad hair happens. Flossers and Wisps - Flossers are a must, especially if you have older teeth. Colgate Wisps are great for a quick brushing and freshening during or after a flight. Band-Aids - I once wore new shoes to the airport and had to spend $8 on two crappy Band-Aids to cover the popped blister on my ankle. Now I carry my own. Glasses Wipe - I always carry one in my bag. OTC Meds - See below. They are sometimes in my liquids pouch, sometimes in this pouch. Face Wipes - For when I feel grody after a long flight. 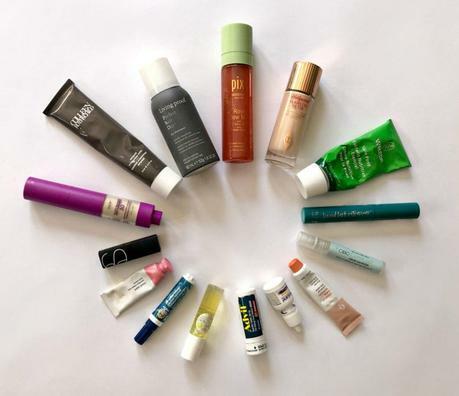 Mineral Powder Sunscreen - See below as I included them with my liquids. Pens - I always bring at least two because one always decides to run out mid-brilliant thought in my journal. My second pouch is my Electronics Pouch. This is the zippered pouch that comes with the Dagne Dover Dakota backpack. In here I keep my chargers, cords, plugs, and a little USB fan I got in yet another swag bag and has become a travel must when stuck on the tarmac and the air isn't yet working on the plane (or when you're just on a hot plane). Also nice when waiting in line outside. This is essentially the same gadget. As for chargers, this one from Anker is my absolute favorite; it can keep me going all day even if I am at a blogger event and taking a ton of photos and videos and using social media without WiFi. 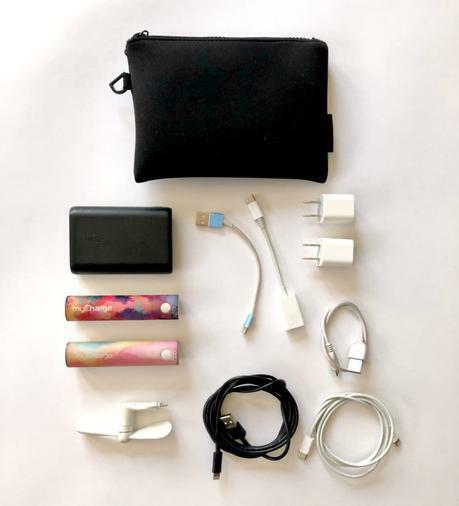 The ones from MyCharge (one I bought, one was gifted to me by the brand a year or so ago) are small enough to fit into a dressy clutch purse or my pocket and will give enough to get through an evening with lots of phone usage. Reusable Water Bottle - You can't bring water through TSA, but if you bring a reusable water bottle, most restaurants at the gates will fill it with water and/or ice for free. Then you also have a bottle once you reach your destination. I've found these days most hotels have a filtered water machine in their fitness centers. This bottle was free when I did a campaign with Fabletics and I like that it's narrow enough to fit in the side pocket of my backpack. A Snack - I always have at least one protein bar tucked in my bag. Terrible options at the gate, hungry on the plane, flight delay, or saving money... it's a smart choice. A Journal - I get some of my best writing done on flights. I have trouble focusing on podcasts and reading, and I rarely have the time to sit down with a pen and paper like I can on a plane. Sunglasses - I wear them to and from the airport, but they're also great at preventing people from trying to talk to you on a flight. Socks - While I'm in line at TSA I will slip off my shoes and if I'm not already wearing socks I'll slip them on to stay off the gross floor and to save time. They're also nice to have on a flight if your shoes are constricting. These are from Smartwool. Laptop and Cord - I don't use my laptop much on a plane unless I have specific work to do but I spend a lot of time on my laptop when waiting for my flight. Here are the items that are in my liquids bag when I am checking luggage. A few of the items aren't liquid but I put them in there anyway because there's room and it's easy to find them later. Hand Sanitizer - A must when flying! I will even wipe down my tray table with hand sanitizer. Stain Stick - Because life happens.